Hew Locke: Starchitect. Image courtesy of the artist, ArtSway and Hales Gallery, London. 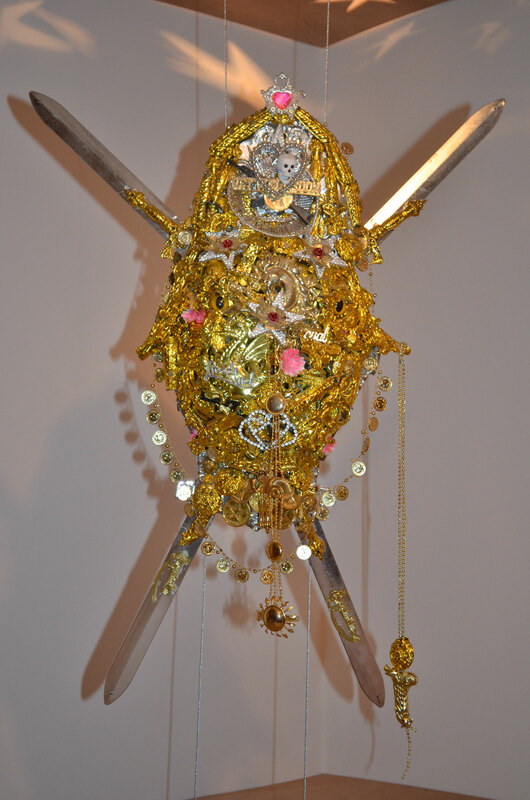 Hew Locke‘s exhibition at ArtSway consists of works made of a variety of gold and silver plastic from pound shops, the most striking of which form shields with crossed swords behind, like would belong in a mediaeval castle. Additionally plastic pearl necklaces have been used to draw royal crests on plain white fabric squares that hang like Royal Standards, which could be attached to trumpets heralding the forthcoming royal wedding. 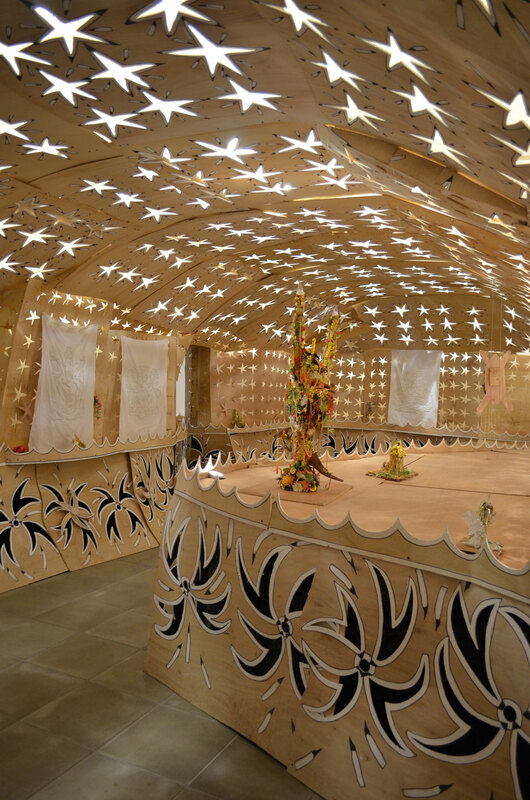 Locke’s work is contained in a structure something like a bedouin tent constructed inside the gallery from sheets of plywood. Each of these is pierced by numerous large star shapes through which the gallery lighting plus some additional lights shine through, creating something closer to a planetarium. This work is the antithesis of recent gold-plated vitrines filled with rubies and Swarovski crystal encrusted skull works by Damien Hirst. It is critical of the lavish lifestyle promoted by these works yet somehow still adopting the same strategy of sparkling works that draw the eye, perhaps that of someone attempting to elevate their class, social status or perceived (or real) wealth, whilst the works are made of materials that cost just a few pounds. Denis Glaser’s Gold, his last work made shortly before passing away at the beginning of the year, on exhibition at Fordham Gallery‘s exhibition at Maddox Arts likewise uses golden materials. 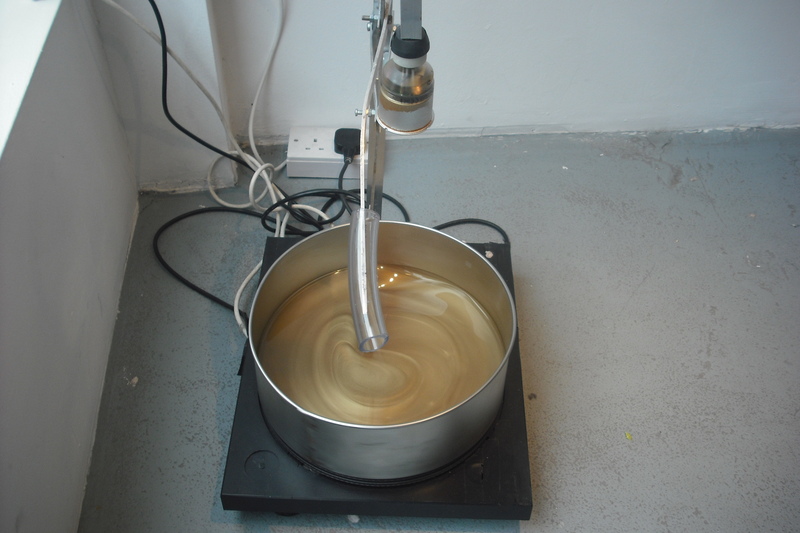 In this piece gold paint or liquid gold is constantly stirred as its container rotates on a record turntable, seemingly awaiting purpose, perhaps also the wedding. Meanwhile it could be seen as a critique of the burgeoning Money for Gold industry sprouting across television advertising, for which those behind the businesses are only interested in the scrap values of gold, melting it down, though investigations by BBC programme Rip Off Britain have shown a price much below this is often offered. This use of gold by contemporary artists is a reflection upon current financial austerity for artists, collectors, and public funds, particularly those for the arts, and even the monarchy perhaps. Finger buffet with paper plates and Primark tablecloths for the wedding, eh, William and Kate? Perhaps not. Besides the current time in history to which these works may refer, time is built within Glaser’s work. The motion of the turntable is not only performing, it is preventing a change of state as the liquid will solidify eventually if left, much like the effect of switching off a Marc Quinn self portrait in frozen blood although changing state in the opposite direction. Five gold spray painted prosthetic limbs also form the fictional work Prostheseus Bound by Zeb Spaw in Wendy Holden’s novel Gallery Girl. This is a humourous and critical look upon the art world and some of its characters, although there is scope to improve the editing of the text and some unexplained jumps between scenes. As this fictitious work fetches twenty million pounds at auction, much like Hirst’s auction just before the recession struck, the book provides thought on the value of art and the sums paid for it. John Keysworth (in From a National to a Central Bank. In Neil Cummings and Marysia Lewandowska (2001) Capital. London: Tate Trustees, p 23&27.) demonstrates the history behind the current relationship between gold and money. He says that when exchange between paper money and gold and silver coinage was suspended during the Napoleonic wars value fluctuated until a Parliamentary Select Committee argued that paper currency which could no longer be converted into gold could only keep its value by limiting its quantity, giving birth to Monetarism. Consequently quantitive easing as applied during the recent credit crunch involved increasing the quantity of currency in circulation against the reserves of gold, except Keysworth notes the UK became totally fiduciary and not backed by gold in 1931. Perhaps this has something to do with how the crisis started? It seems that the use of gold in contemporary art is therefore addressing the politics of the economic system and its impact upon the value of gold, currency and art. Cummings and Lewandowska’s photographs on pages 92 and 93 of the book demonstrate the similarity between a bank vault storing gold bars and that of the Tate Gallery, storing artworks, which are physically better protected in their cases, where the bars are on open pallets. Similarly Meekyoung Shin has used the packing cases the sculptures in Translation Vases (2009) are transported in as their plinths and also gold leaf on the work Golden Buddha (2010) in her Translation project exhibition at Haunch of Venison, London. These vaults and cases perhaps reflect protective instincts among the rich and art collectors. Over the past few bleak months of a winter of recession, and as related public sector cuts started to take effect, it seemed that the economic situation may have impacted upon the content of art being made and exhibited. There was a lot of monochromatic work around, black and white photographs by Christopher Thomas in an exhibition entitled ‘New York Sleeps’ at the Wapping Project, Bankside, Eadweard Muybridge, Fiona Banner’s Harrier and Jaguar and the Otolith Group at Tate Britain, Ai Weiwei’s Sunflower Seeds at Tate Modern and John Stezaker at the Whitechapel Gallery, to name just a few exhibitions. But now as the spring has arrived, a more vibrant, gold colour has taken up the critical challenge, addressing value, both cultural and financial, and the relationship between the two. Hew Locke is on exhibition at ArtSway, Sway, Hampshire, England until 3rd April 2011 and a linked exhibition opens at Arts University College Bournemouth on 14th March. Denis Glaser is on exhibition at Fordham Gallery at Maddox Arts, 52 Brook’s Mews, London until 19th March. Damien Hirst, it has just been announced, will be the subject of solo exhibition at Tate Modern during the summer of 2012 including the London Olympics. Meekyoung Shin Translation is at Haunch of Venison, 6 Burlington Gardens, London until 2nd April.